When you stay at Bakersfield Inn & Suites in Bakersfield, you'll be in the business district, within a 10-minute drive of Buck Owens Crystal Palace and Rabobank Arena. 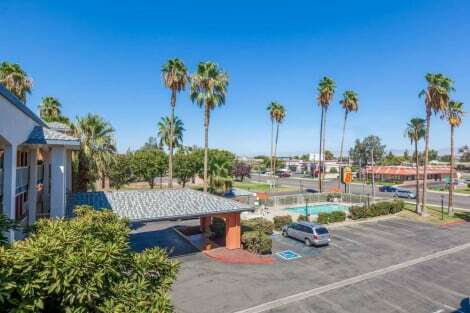 This motel is 6.9 mi (11.1 km) from California State University-Bakersfield and 2.1 mi (3.3 km) from Valley Plaza Mall. Located in Bakersfield, Vagabond Inn Bakersfield North is within a 15-minute drive of Buck Owens Crystal Palace and Rabobank Arena. This hotel is 6.6 mi (10.6 km) from California State University-Bakersfield and 3.1 mi (5 km) from Links at Riverlakes Ranch Golf Course. Make yourself at home in one of the 102 air-conditioned guestrooms. Complimentary wireless Internet access keeps you connected, and cable programming is available for your entertainment. Bathrooms with showers are provided. Conveniences include phones with free local calls, and housekeeping is provided daily. When you stay at Days Inn by Wyndham Bakersfield in Bakersfield, you'll be near the airport, a 4-minute drive from Buck Owens Crystal Palace and 7 minutes from Rabobank Arena. 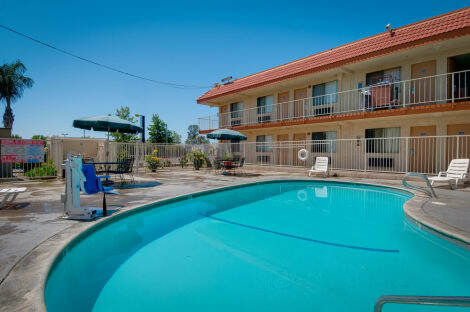 This hotel is 4.4 mi (7.1 km) from California State University-Bakersfield and 0.4 mi (0.7 km) from Camelot Park. At Value Inn, enjoy a satisfying meal at the restaurant. With a stay at Rodeway Inn & Suites Bakersfield in Bakersfield, you'll be a 4-minute drive from Buck Owens Crystal Palace and 7 minutes from Rabobank Arena. 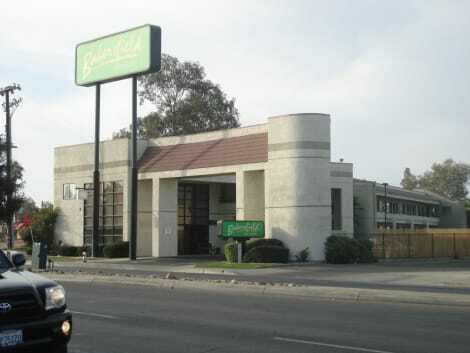 This hotel is 4.4 mi (7.1 km) from California State University-Bakersfield and 0.5 mi (0.8 km) from Camelot Park. With a stay at Vagabond Inn Executive Bakersfield Downtowner, you'll be centrally located in Bakersfield, a 3-minute drive from Rabobank Arena and 6 minutes from Buck Owens Crystal Palace. This hotel is 6.1 mi (9.8 km) from California State University-Bakersfield and 0.7 mi (1.1 km) from Fox Theater. Make yourself at home in one of the 60 air-conditioned guestrooms. Complimentary wireless Internet access keeps you connected, and cable programming is available for your entertainment. Conveniences include desks and coffee/tea makers, and you can also request cribs/infant beds (complimentary). lastminute.com has a fantastic range of hotels in Bakersfield, with everything from cheap hotels to luxurious five star accommodation available. We like to live up to our last minute name so remember you can book any one of our excellent Bakersfield hotels up until midnight and stay the same night.